I tried mushroom bhaji for the first time recently when a friend ordered take out from an Indian restaurant that’s pretty well known in Ontario. It was simple, delicious and oily. So I set out to make my own (for a fraction of the cost). I tried traditional recipes with and without tomato; with and without fenugreek (which isn’t in most traditional recipes but was in the restaurant’s version); a variation using curry powder; and a traditional thick sauce versus a slightly watery sauce (like the one served at Curry Original’s in Kingston, ON). 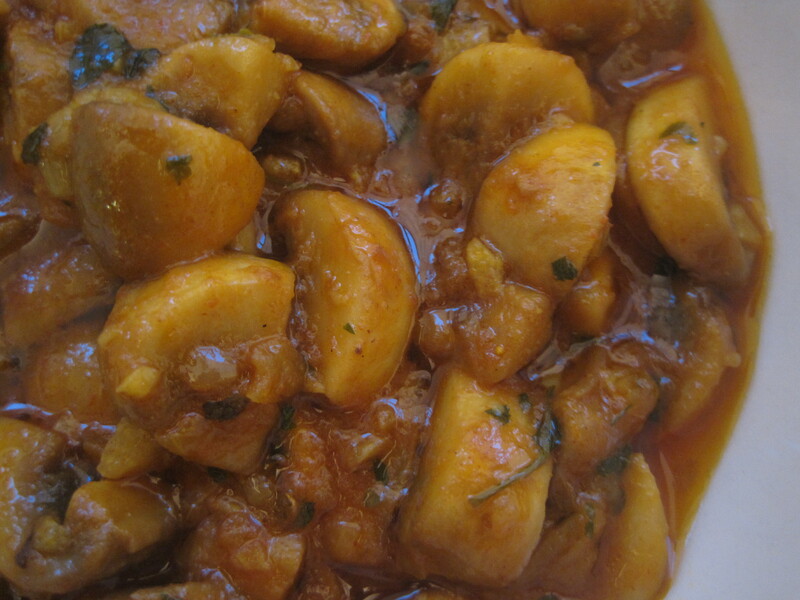 Here’s my favourite mushroom bhaji recipe. See here for tips on how to get the most flavour out of your Indian spices. Cut the mushrooms in half and then cut them into small equal sized wedges. Melt the ghee over medium heat in a heavy bottomed pot (I use a ceramic dutch oven). Add oil if using. Saute onion for 3 minutes. Add garlic and saute for 1 minute. Add all of the spices and cook for 3 to 4 minutes. Add the mushrooms, tomato paste and salt. Mix and cook for 1 to 2 minutes. Add chicken broth according to the consistency of the sauce that you want. Lower the heat to a simmer, cover and cook for 6 to 7 minutes. Serve immediately with rice (basmati or jasmine preferred).